Good stuff for the good life with your good dog. Stuff good enough for our dogs didn’t exist. So we made it. We started 7 years ago with BarkBox, and as we grew, we learned a ton about how dogs live their best lives. It’s not all fun and games; sometimes ya just gotta take care of business. That’s why we created BARK Essentials. They’re the must-haves—made better—for daily life with four-legged loved ones. And thanks to Amazon fulfillment, you’ll get everything you need fast with 2-day shipping. Featuring a machine-washable cover on top of thick memory foam. Sweet dreams are made on these. Available in small, medium, large, and x-large. Bark got this one right!!! Gus absolutely LOVES his new bed!!! He can often be found relaxing in style! He has started sleeping on his bed instead of mine!!! Thanks BarkBox, for providing such a great product for my boy! 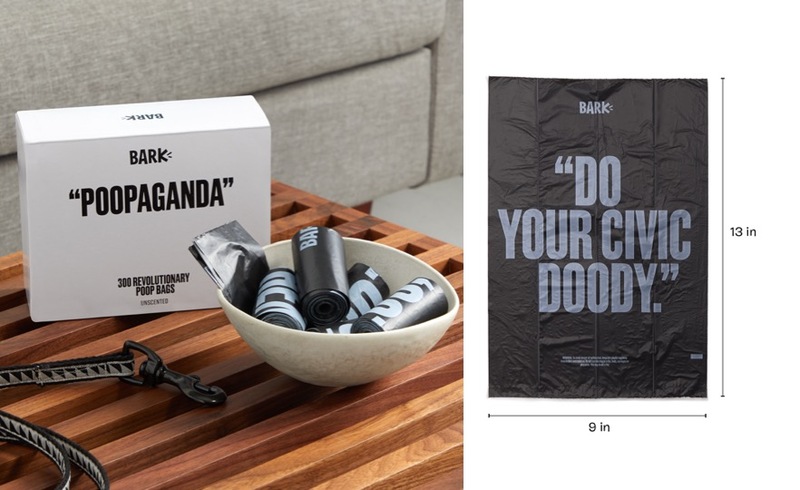 We love these poop bags! They are god quality, so we don’t worry about rips, a nice large size, and hilarious. Makes a miserable situation (sh*tuation?) more bearable. Want to test our new products when they launch? Sign up to be a BARK Beta below! Thank you for signing up to join the Bark Betas! We’ll be reaching out to you a few times a year with new products that we are launching to test for free. We appreciate your honest feedback. Questions? Comments? Our customer service team is always happy to chat about your dogs and what they need! Call 1-844-231-2275 or email amazon@barkbox.com.